Most birders are familiar with the dawn chorus, as well as beautiful songs their favorite birds sing throughout the day. It can be startling, however, to hear different birds singing at night. In fact, there are many bird species that sing at night when there are fewer ambient noises and less vocal competition from other birds. Recognizing these nocturnal musicians is a great way to sharpen birding by ear skills and enjoy a unique aspect of avian communication. 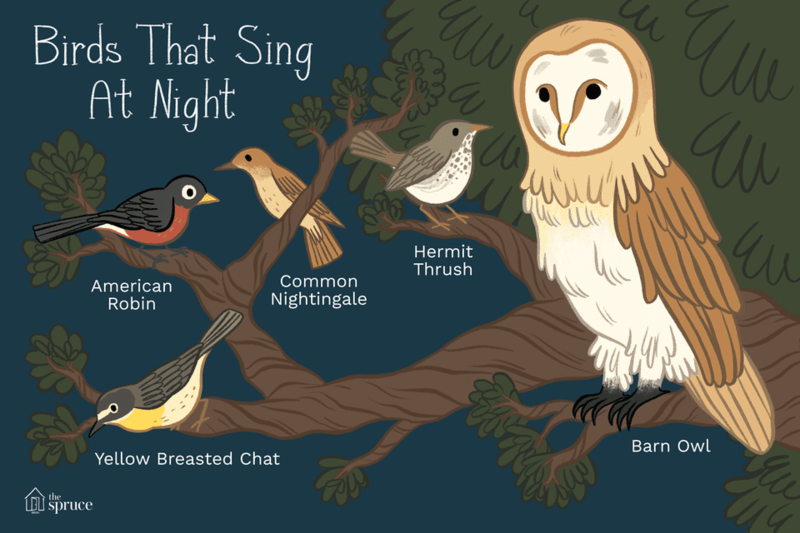 How many of these nighttime singers have you heard? 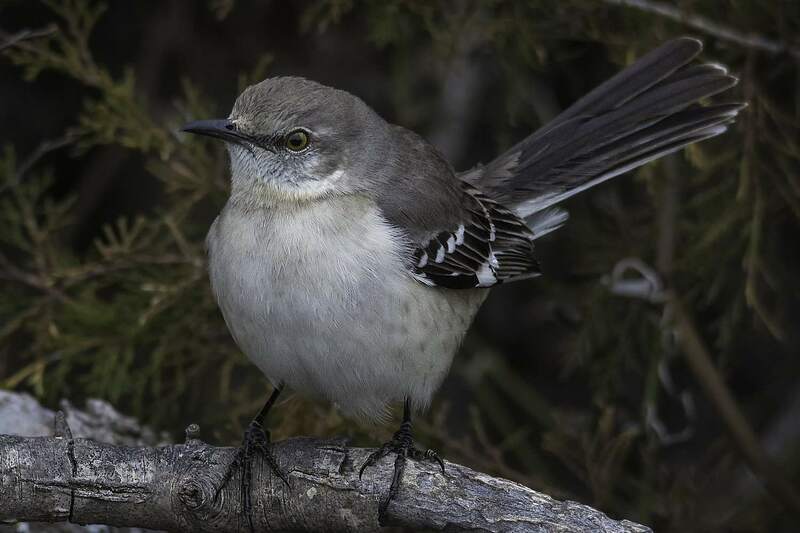 An accomplished mimic with a broad repertoire, the northern mockingbird is one of the most familiar night-singing birds. Found throughout the United States, southern Canada, Mexico, and the Caribbean, these birds sing different tones, notes, and sequences in sets of three, switching to a new tune frequently to show off their vocal prowess. They often sing from a high perch and are common in urban and suburban areas. This member of the nightjar family is much more easily heard than seen, thanks to its highly camouflaged plumage. Because these are nocturnal birds, they often stay quietly roosting during the day, but at night they speak up with a chanting song that rises at the end. The characteristic notes that sound just like the bird's name may be repeated in an ongoing, even sequence over and over for many minutes at any time of night. This reddish-brown thrush is one of the most beautiful songsters of North America, and its range spreads from Mexico into Canada depending on the season and migration timing. With a lilting song filled with musical whistles and warbles, this bird is easy to hear, and it often sings very late in the evening or early in the morning. This is particularly true in early spring and late fall, when this bird's singing may extend further into the nighttime hours. This favorite backyard bird of North America has a familiar song, and it is a common member of the dawn chorus. Light pollution in urban and suburban areas, however, can easily trick this thrush into singing through the night, especially in the spring when songs are part of courtship rituals. Because this bird can stay in much of its range year-round, this can also lead to nighttime singing even in fall and winter, no matter how unexpected its songs may be. While these wading birds don't have a musical song, their raspy, croaking calls are commonly heard all through the night. This can add an eerie overture to the marshes, swamps, and wetlands these birds call home throughout their range. Because these birds are found worldwide, including North and South America, Europe, Africa, and Asia, their voices are familiar to many birders, as are the calls of other night-heron species. One of the most prolific songbirds in Europe, Asia, and Africa, the common nightingale may at first seem plain, but its song is anything but ordinary. This bird can have more than 200 songs in its repertoire, and it might sing them all at night. While the common nightingale is relatively shy and often stays undercover in dense brush, its rich, flute-like voice and varied songs can be heard for great distances and for long periods of time, since this bird is never tired of singing. This large, warbler-like bird may be brightly colored with its bold yellow throat and breast, but it prefers to stay hidden in thickets. When it wants to sing, however, it will occasionally venture into a more open spot and thrill listeners with warbling chirps, whistling chatters, and some raspy notes all woven into a loud and easily heard song. These birds typically only sing in the spring, but during that time they are often heard at night. A small songbird with a big voice, the European robin often sings year-round as it defends territory, and bright urban or suburban lighting can fool this bird into singing through the night. Fortunately, the high, lilting song and occasional whistling tones make a beautiful song that many birders appreciate at any time. When not tricked by artificial lighting, the European robin often sings early in the morning and late in the evening. This familiar shorebird has a distinctive piercing call that can sound like a frantic, chattering song, even at night. These birds also often call while in flight, no matter what time of day it is, and may be calling through the night as they migrate in late fall and early spring. To hear killdeers, however, birders will need to listen for these distinctive birds in the proper habitat near shallow water or open, barren fields that are ideal for nesting and foraging. A secretive swamp bird found in scattered parts of the southeastern United States, including coastal Texas, as well as in the Caribbean and isolated parts of South America, the black rail has a distinctive song-like call. The ki-ki-kooo call may be repeated over and over during the night, and has a rich, pipe-like tone. Because these birds are shy and reclusive, hearing their distinctive song is often much easier than spotting their dark plumage at night. It's no surprise that owls are vocal at night, and the barred owl has a mournful hooting call with longer notes at the end that can be heard throughout their range in the eastern United States, western Canada, and the Pacific Northwest. These large owls may be soloists as they sing, or often pair up in duets during the courtship and breeding season. A pair of owls may call to one another repeatedly throughout the night, and solo birds will also sing for hours after dark. The barn owl is one of the most widespread species of owl, and is found on every continent except Antarctica. While its long, loud, rasping screech isn't a true melodious song, it can be heard at any time of night as these birds are active. Their other sounds include a clicking, kleaking chatter, as well as more whispery begging calls young birds use to attract their parents' attention. Birders who put up barn owl boxes may hear all these unusual sounds through the night. How Much Do You Know About the American Robin?